Political and social forces exert pressure on our globalized economy in many forms, from formal and informal policies to financial theories and technical models. Our efforts to shape and direct these forces to preserve financial stability reveal much about the ways we perceive the financial economy. The Handbook of Safeguarding Global Financial Stability examines our political economy, particularly the ways in which these forces inhabit our institutions, strategies, and tactics. As economies expand and contract, these forces also determine the ways we supervise and regulate. This high-level examination of the global political economy includes articles about specific countries, crises, and international systems as well as broad articles about major concepts and trends..
International Financial Institutions: How Much Autonomy? Why Do Countries Repay Their Debts? Why Do Countries Borrow So Much? Why Investors Would Hold Different Equity Portfolios? Which Countries Had a Systemic Banking Crisis in 2007–09? Policy Responses in the 2007–09 Crises: What Is New? How Costly Are the 2007–09 Systemic Banking Crises? Are Financial Sector Bonuses Actually Deserved? Financial Stability: National or International? Organization of Supervision and Crisis Management: Can National Responsibility Be Effective? Does Price Stability Promote Financial Stability? Does Price Stability Guarantee Financial Stability? Does IT Constrain the Response to Financial Crises? Why Do Governments Participate in ‘G’ Groups? From Basel I to Basel III: What Has Changed? What are the Unresolved Flaws of Basel Regulations? 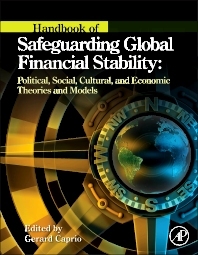 "The Handbook of Safeguarding Global Financial Stability provides an essential resource for an integrated perspective on financial stability, incorporating advanced analysis that surpasses immediate reactions to the Global Financial Crisis. The views of key policymakers and accomplished scholars are brought together to illuminate financial stability from the perspective of the political economy, economic models, and regulatory functions." "This book combines high academic expertise and practitioners' insights into the Global Financial Crisis. It is the kind of the book welcomed by academicians, practitioners, and policy makers who want to understand not only the complexity of this Crisis but financial crises in general."